Colin and I returned from our Christmas and New Year celebrations in New Zealand to balmy, blue-skied Brisbane. After a week of overcast-skies, wind, and four-days-straight-rain, there was a small part of us that relished the return to our new, tropical home. Initially, the New Zealand dampness felt wonderfully luxurious: my curly hair sucked up the moisture, tightening and bouncing like a gollywog’s head; the edges of asthma that had plagued my lungs for months completely disappeared; while the green lushness of the landscape (and the occasional need for cardigans and cups of tea) simply and constantly wrapped us in memories, proclaiming that we were home. On our return, we had three days to relax in Brisbane before we returned to work. While I initially had vague plans of a road trip to Byron Bay, the intensity of the silly season festivities, multiple reunions, and even a wedding celebration, meant that we returned feeling sorely in need of weightless existence. On day three of this vegetative state, I rallied, and embarked upon an entire day, virtually, of cooking and eating. Progressive Dinner Parties were a novelty in my parents’ more youthful years. They involved car-loads of people descending on one house for nibbles, another house for entrees, yet another house for the main course, and so on in this fashion over the course of an evening. While eschewing one key element of a Progressive Dinner (movement across space), I nonetheless created my own version of such events, utilising consumption over time. I had had a conviction to cook and eat a three-course meal for weeks, but the thought of three courses in close succession, was simply too much to bear in the heat we were enjoying. So, starting at 11am, and finishing at 5 at night, I cooked and we devoured a delicious three course meal. The first task was dessert preparation. In fact, the initial impetus for this particular day occurred in November 2011 when I was struck by the desire to make Valli Little’s recipe for blueberry tarts featured in that month’s issue of delicious magazine. 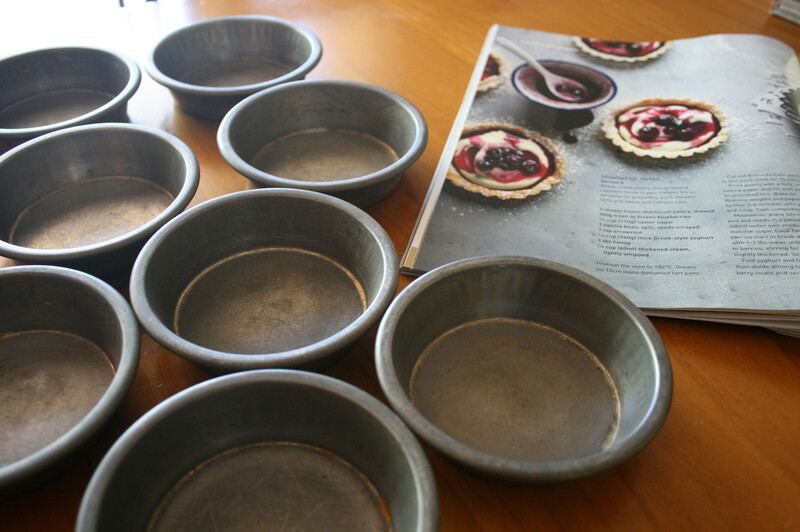 A full two months before this event, I had purchased a set of eight small tart tins from a second-hand shop, and on seeing this recipe, I just knew that these tarts would mark the tins’ debut in my kitchen, and moreover, would crown a uniquely indulgent day in the near future. After researching how to clean old metal tins, I proceeded to scour them with baking soda and hot water. 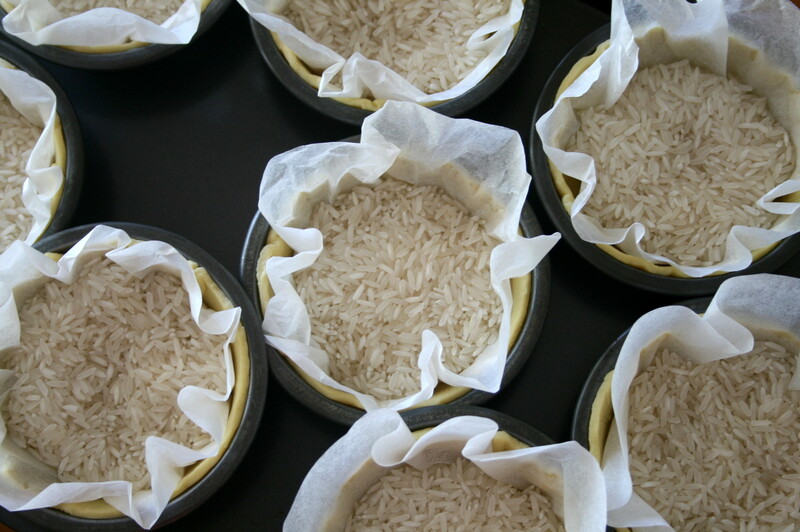 Once refreshed of their rusty-tinge, I buttered them, inserted circles of baking paper in their bottoms (Valli’s recipe called for loose-bottomed tins, so I wasn’t going to take any chances), folded shortcrust pastry gently into their depths, chilled them, lined them with more baking paper filled with rice, blind baked them for ten minutes, removed the rice and paper, and baked them for a final five minutes. (One of) my idea(s) of a good time is kitchen-pottering, but after this two-hour period chained to the kitchen bench I cursed my folly, swearing never to bake tarts again. While the tart cases were baking, I proceeded to make the cocktail for the event, which constituted the “entree” course of the meal (what? 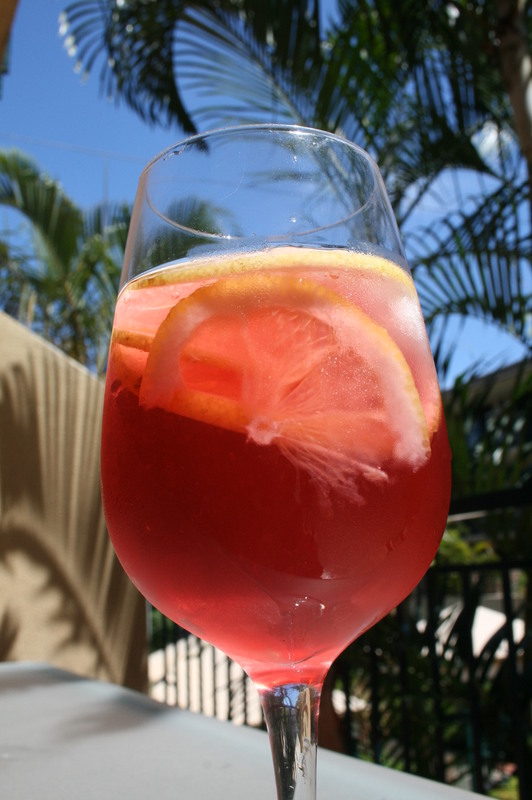 Cocktails are carbohydrates (and hence a food group) aren’t they?). 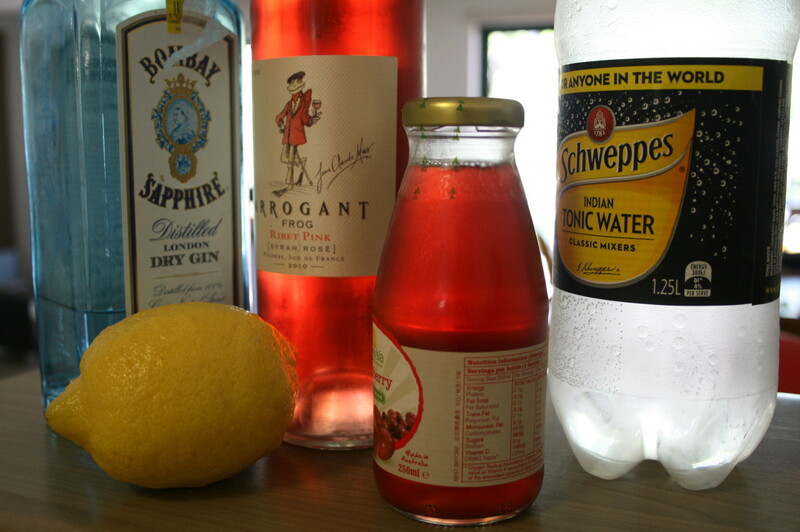 This recipe for Pink Gin & Tonic made a delightful beverage that revived my vulnerable resolve. Stir all ingredients together in a large bowl or jug. Ladle or pour into glasses. This sunshine-in-a-glass was consumed gradually over the next hour or so as Colin and I watched an episode of Mad Men, which we were completely absorbed with at the time. 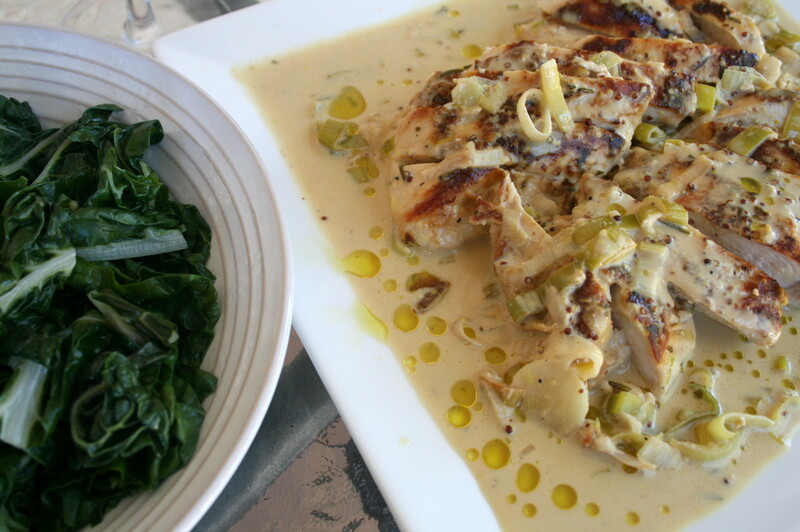 Suitably rested, I then tackled the main course, Jamie Oliver’s tasty dish of cream-and-mustard-sauced chicken; the recipe for which I had seen made on TV and later scribbled down from the cookbook that Amy had conveniently acquired. To accompany this, I steamed a bunch of silverbeet, requiring, as I usually do, the unadulterated irony-tang of simple green vegetables to offset the richer star of the show. The heat of the day dictated that further additions to the plate be eschewed. After a meaningful pause, the day’s purpose was once more taken up with vigour, focusing this time on the long-awaited tarts. Mixing together equal quantities of whipped cream and yoghurt with a touch of honey, I filled the cases, then topped them with the fresh blueberry and vanilla sauce I had made earlier. Yes, I admit, that the success of the pink cocktail meant that I had slightly over-cooked the pastry cases and more than slightly over-thickened the blueberry sauce. While the tarts lacked some of the visual appeal of Valli’s version, they found their home in our stomachs without any issue whatsoever. I took some wonderful photos of Colin’s besmeared face and pudding-drunk eyes that I am understandably forbidden to share, but filed away for my own satisfaction, they represent a fitting end to a holiday, and a good day’s work indeed.